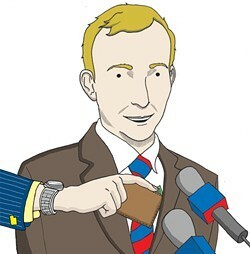 What began with much saber-rattling by Salt Lake County Mayor Ben McAdams in a late Spring 2015 press conference ended with a judicial whimper on Jan. 11, 2016 when McAdams' former campaign manager Justin Miller received a sentence of probation for stealing campaign funds. Miller appeared before Third District Court Judge Randall Skanchy to hear his sentence on one count of communications fraud, a second-degree felony. He had pleaded guilty in October 2015. The then-Utah House representative resigned his seat at the same time as taking a plea deal, something of a relief for Utah's Democrats who had been pressuring him since June to step down. Miller had been charged with stealing close to $25,000 from McAdams' mayoral campaign. As part of his plea deal, the charge was dropped to a third-degree felony and Miller was given a suspended zero-to-five years sentence, along with 250 hours of community service. According to local press reports, Miller will be under supervision for his probation for 18 months. But this may not be the end of the affair. McAdams in his victim statement alleged that Miller had stolen an additional $80,000. Davis County prosecutor Steve Majors told the Salt Lake Tribune he planned to sit down with investigators to assess those claims. CW covered the Miller debacle in a cover story in May 2015, which also included an audio recording of McAdams confronting Miller about what the former called his "betrayal." The FBI looked into Miller's complaints against McAdams and the county, which revolved around concerns over contracts, but found no wrong-doing according to a statement by the feds to Fox 13 in late 2015.